Today I had the morning off. And I decided to take the bus and get lost in Trastevere. So, after an uneventful bus ride, about 5 minutes long (I was expecting a mess in front of the School and University Ministry, since there have been demonstrations this week), I get off and head for the small, cobbled streets that have made Trastevere famous. I pass by the church of Santa Maria in Trastevere, by the place where last Saturday I spent the night until 3 am, the Doors blasting, drinks pouring, even after it closed (my girlfriend is close friend with the owner, so we stayed in after they closed the doors), and started my walk in the vicoli, the narrow streets. Such a contrast between morning time and Saturday night. Most of the resturants/pubs were closed. Few people walking around, sitting at cafés, displays of fruits and vegetables outside stores, some shops open, with their delightful (and very expensive!!!) offerings of clothes, bags, shoes, chocolate and gourmet food. 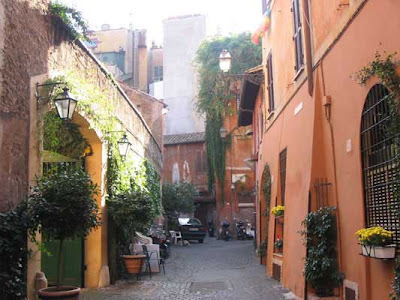 I start walking in the "Vicolo del Bologna", which becomes narrower while the buildings seem to grow taller. Squares of sun and shadow alternate on the cobblestones. Plants grow on the wall. And suddenly this strong smell. I recognize it: it's pasta sfoglia (something similar to phillo paste, but not quite), it all its buttery gloriousness. Then the street end in another, larger one. More people walk by. I notice an old lady (about 60) with a black suit jacket, floral long flowy skirt, and a cloche. She looks lovely. And a bike passes very close to me. An older lady is riding: white short air, black pants, extremely elegant. I want to be like her when I am 70. I have walked for a while now. I head towards Viale Trastevere, where I can take my bus. I pass in front of the Ministry again. I hear a lonely voice, someone left a recorder. It keeps repeating. "Stella, parlami" (Stella, talk to me). Stella is MariaStella Gelmini, secretary for school and university affairs. She doesn't want to talk to the protesters. She says they're all terrorists. But the sun is shining, it smells food, and I feel like smiling. It's a beautiful Friday!